Join us for food, friends and fun! Bring the whole family and a dish to share. This event will be perfect for both pre- and post adopt families. The Pot Luck will take place on Saturday, February 11th from 5 to 8 PM at the Betty Taubert Girl Scout House, 37 Wayside Lane, Scarsdale, NY. Dinner is free, but RSVP is required, so click here to preregister. This is one of our most popular events, so we can't wait to see you all there! Join us for our annual Halloween Party at Port Chester Middle School from 5-8pm. Enjoy great food, terrific kids' entertainment, crafts ad good times with old and new friends. Costumes are encouraged (for both kids and adults). At the door prices: Member families $25, non-member guests $15 per person. Whether you're just thinking about adopting, on your way to bringing your child home, or already parenting a teenager, this mini-conference has the information and networking for you. Come build your adoption network and meet adoptive parents and adoption professionals in a relaxed atmosphere. Choose from among 6 workshops in 2 sessions which will include topics of interest to both pre-adopt and post-adopt families. A pre-adopt information session can also be held if there is enough interest. Admission is $75 per couple/family for non-APC members (includes a year's membership) and $25 per couple/family for current APC members. The event will be held from 5:30-9:00. Adoption Advertising - Cynthia DiMacini (Adoption Advertising Services) & Janine Castagna, Esq. Domestic Adoption 101 - Joy Goldstein, (Forever Families Through Adoption), Mia Padwa (Family Services of Westchester), Michael Goldstein, Esq., Denise Seidelman, Esq., Nina Rumbold, Esq. Click on the image to see the print flyer for this event. Please print it out and help spread the word! 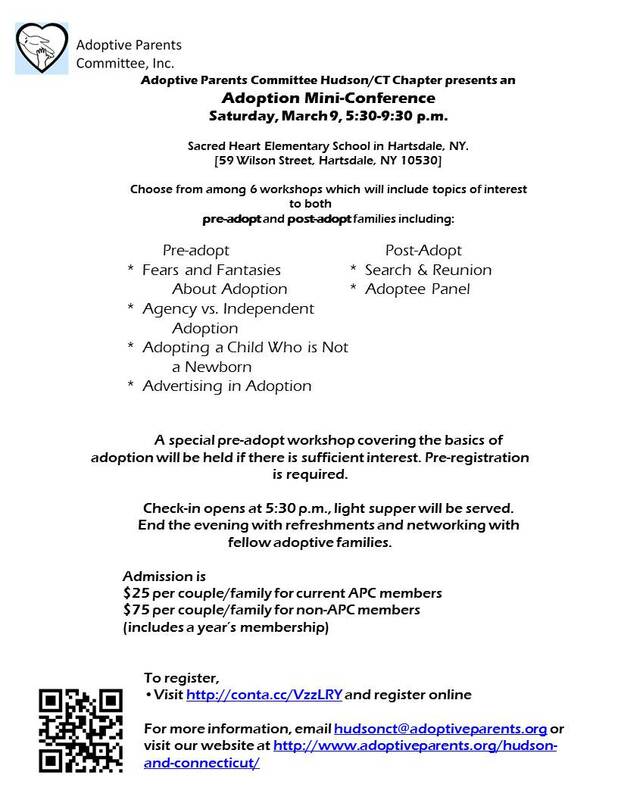 If you would like an electronic copy of the original flyer, email Missy Carvin at hudsonct@adoptiveparents.org. Join us for our Annual Haloween party and enjoy great food, terrific kids’ entertainment, crafts, and good times with old and new friends. Kids, make sure to come in your favorite costumes. Parents, feel free to come in costume also. Send in your reservation early and save $5.